Passion drives music, but in the case of a certain Bengaluru-based band, it was emotions that brought the whole group together. River Man Band, is a tribute band started by Luke Pattison, the bassist of the band, for his late brother Dwight Pattison, a noted musician from Mumbai who has performed alongside Adnan Sami, Leslie Lewis and Gary Lawyer. Formed early last year, the unit believes in only originals and has written 16 songs so far. 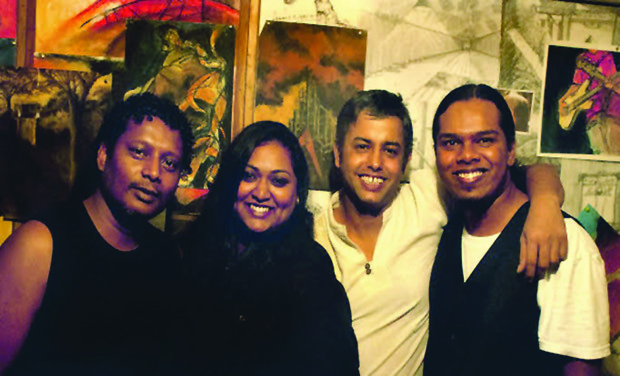 Resurrecting the typical elements of 80s’ pop bands with funk, jazz, soul, motown, r&b, disco and reggae in its music, the band also comprises Jerusha Verghese (lead vocals), Nisha Idicula (backing vocals), Osi Gomango (acoustic guitar, lead vocals and lyricist) and Wesley Newton (drums). Next, it will perform at Vapour Pub & Brewery of Indiranagar at Bengaluru on January 8. Luke and Wesley bumped into each other at a jamming session in one of the local pubs. “We were both blown by each other’s talent and decided to jam once again together,” says Wesley. It began with these two and then Osi was called upon from Kolkata to work with them for lyrics. With a drummer, a bassist and a lyricist, the formation of the band was set in motion. “The idea behind our music is to revive the sounds of the bygone era and we needed a vocalist who could carry that rhythm. Hence began the auditions,” adds Luke. Speaking of vocalist, Jerusha never thought she would sing in a band, “but I fell in love with their music the moment I heard it and the rest as they say is history,” she cites. Going back to the beginning, Luke wanted to start a band as a tribute to his late brother. “The name is synonymous with Dwight, for he loved being by the water. During our gigs we play most of our originals and a few of Dwight’s songs too, like Going Going Gone and Lessons,” Wesley adds. “Luke wrote a song, River Man which spoke of his brother and when I was supposed to sing it, I wasn’t sure if I could. It is a song that has moved all of us, emotionally. But then, I know the pain of losing someone close and I could relate with it,” adds Jerusha who loves listening to country music. Her favourite song from the band’s repertoire is Stay. “It is a fast track that has a lot of funk and pop groove to it,” she says. Speaking of influences, Wesley, a former band member of Slain says it was the Black American Gospel music that has moulded his musical inclination during his formative years. Nisha on the other hand, has been singing with different bands across various genres of music over the past eight years, while Osi is the founding member of the well-known Kolkata rock/pop outfit Krosswindz, and was playing with the outfit until recently when he moved down to Bengaluru. As for what the future holds, the band hopes to one day release its own album apart from “an album with Dwight’s unreleased songs one day,” says Luke.